By late January, you've probably enjoyed at least a few of the seasonal beauty snafus that are hallmarks of the dead of winter: chapped lips, rough elbows, ragged cuticles, and a little frizz, with some static thrown in for good measure. In other words — you're a bit of a mess, beauty-wise. And truthfully, we'd be in the same state if it weren't for our secret weapon, a handy little do-it-all balm made right here in the DMV. Skincando's Combat-Ready Balm is loaded with coconut oil and beeswax, and was originally dreamed up by founder Sara Damelio to heal and protect soldiers' skin in war zones. (How's that for tough stuff?) Made in micro batches from only natural and organic ingredients, the product is super-concentrated, which means it lasts twice as long as your standard skin cream. Here on the homefront, we use it for, well, everything — it prevents razor burn, adds a high dose of moisture for dry skin, and soothes wind-blistered lips. It's our go-to whenever we want to travel light, since this baby does a little of everything. 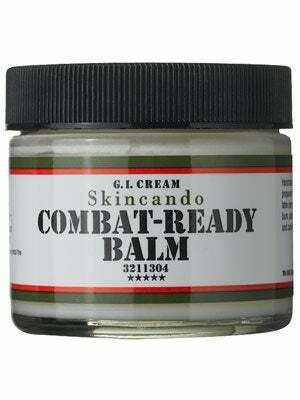 Skincando Combat-Ready Balm, $5-$60, available at Skincando.